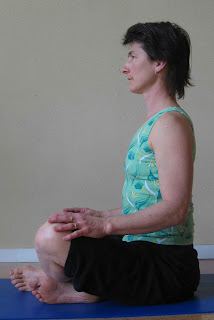 Begin with a simple cross-legged seated posture, Sukhasana: Easy Pose. Or, as Asana is more correctly translated seat, “Easy Seat.” In spite of its name, this is not an easy seat for everybody. 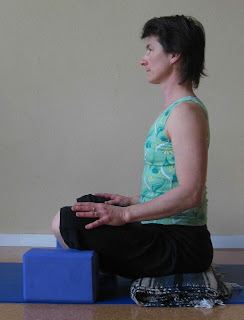 To make Sukhasana comfortable, grab a couple firm blankets and a couple foam blocks and come to your yoga mat. Fold the blankets carefully, to form a rectangle large enough to sit on. Set the blankets on the floor so that the clean folded edges are stacked directly on top of each other facing the front of the room. Sit down on the blankets and cross your legs in front of you with your feet on the floor under your thighs. You want the blanket stack high enough that your ankles are comfortable and your knees near the height of your hips. If your knees are much higher than your hips, then add some more blankets to your stack so that you can begin to bring them level. Use the foam blocks (or additional blankets) to provide support under your knees. Your inner thigh muscles will be more willing to release and lengthen if there is something for them to release into. Thin blankets can also be used as additional cushion under your ankles. You can practice without props if you can comfortably maintain a neutral spine without pain in knees, hips or low back. Let your upper arm bones fall straight down from your shoulders. Bend your elbows and rest your hands on your thighs. Now close your eyes and notice how you feel. Make any small adjustments you need to find comfort and ease. Notice if your weight is balanced equally right and left on your sitting bones. 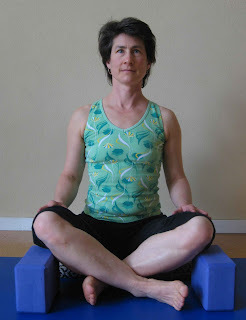 I like to wobble around on my sitting bones and then find center again to bring my pelvis into alignment. Once you feel clearly centered begin to notice your spine. As you inhale, make space in your spine, realign, grow taller. As you exhale reconnect to the earth directly through the sitting bones but don’t slump. You want to allow the natural curves of the spine while creating as much height as possible. Sukhasana is a great pose for breathing exercises and sitting meditation. You can add a forward bend to Sukhasana and you’ll get a great outer hip stretch and hip rotator stretch. You can take your fingertips to the floor behind you and add an upper back backbend and heart opener. And finally, you can turn this pose into Parvatasana by interlacing the fingers and extending the arms alongside the ears toward the ceiling thereby stretching your shoulders. As the pose becomes familiar and your inner thigh and hip flexors lengthen and become at ease, you can graduate to Half Lotus, Ardha Padmasana. Begin in Sukhasana. Slip the outer shin forward and lift it up and over the other shin. Rest the foot of the lifted leg onto the opposite thigh and then rest both your knees back toward the floor. Your half way to lotus pose!